Our mouth depends on healthy gum tissue to protect our teeth and jaw. Unfortunately, we can wear down and even destroy gum tissue eventually exposing the softer and more sensitive roots. When we lose gum tissue around a tooth it’s called gum recession or a receding gum. Unfortunately, we naturally lose gum tissue as we age, even if we maintain a healthy mouth. Other causes of gum recession can be from aggressive brushing, flossing, even the use of an old or hard toothbrush. Other more significant causes of gum recession include excessive tobacco use, gum disease (periodontal disease), clenching or grinding of teeth, crowded teeth or a misaligned jaw, mouth trauma, certain health issues, even hormones and genetics. Ignoring receding gums can make the problem worse. Exposed roots are easily damaged without protection, causing additional gum loss and reduced protection all the way into the jawbone. Serious infections, tooth loss and bone erosion can occur. The key to protecting your mouth from further damage is to determine the cause of the recession. In many cases, you can visibly see the receded gum or one tooth looks longer than the others. You may feel a ridge or notch when you run your tongue along the receding gum line. Another sign of receding gums is sensitivity to sugar, acid, heat and cold, even brushing. Unfortunately, receding gums don’t repair themselves, but there are a few steps you can take at home to reduce the irritation until you can see your dentist. Depending on the underlying cause, you may be able to take steps to reduce future gum loss. Waiting or ignoring receding gums can lead to unnecessary discomfort, additional gum loss and more serious and costly conditions. Getting to the root of gum loss is the fastest way to prevent further damage. A visit to Dr. Sedki can help you determine if a simple change in habits can stop the process. Dr. Sedki’s office is equipped with the latest technology to keep your smile healthy and beautiful. If you’re concerned about your receding gum lines call Dr. Sedki today. Dr. Sedki uses the Chao Pinhole® Surgical Technique. Unlike traditional methods, there are no grafts, no sutures, and no incisions needed with the Chao Pinhole Surgical Technique™, just a small pinhole, followed by the adjustment of the existing tissue. 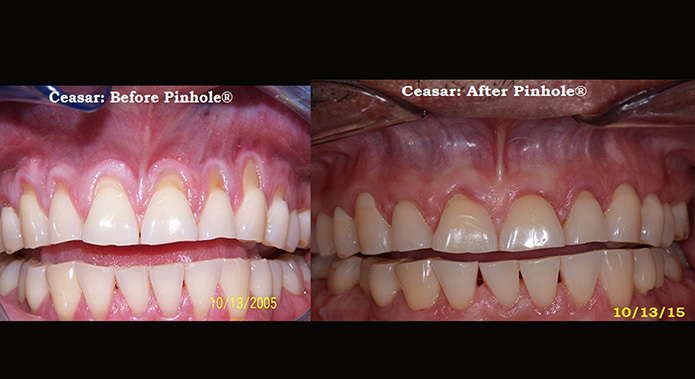 FOR MORE INFORMATION ON THE PINHOLE SURGICAL TECHNIQUE, OR OTHER POTENTIAL TREATMENTS OR RECEDING GUMS CONTACT DR. SEDKI’S OFFICE TODAY!